I love to see various animations because they tend to compress things, allowing me to absorb more information in a shorter period of time. But sometimes, these animations are depicting topics that make us think more about our own humanity. This is the case with this timelapse video map created by Japanese artist Isao Hashimoto. 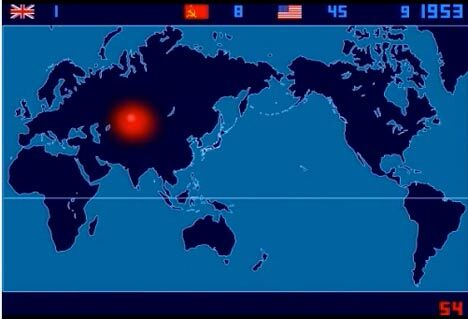 It shows all the nuclear tests that have occurred in the world between the years 1945 and 1998. The animation was created using data collected by two Danish researchers, until the year 2000. The map created by the Japanese artist shows all the controlled atomic tests from 1945 to 1998. Although it may seem common and boring at first glance, the animation is really terrible once you see the enormous number of nuclear tests that have been made on Earth and the numerous countries that have atomic bomb technology. No less than 2053 tests occurred in the last 53 years, ever since the “Manhattan Project” that produced the first atomic bombs during World War II. Once you see the video you will observe that 1962 was the year with the most nuclear tests. United States, the Soviet Union, Britain and France made ​​no less than 140 nuclear tests in that particular year. Pakistan test series is also included in the animation. From 1998 until now, only North Korea has conducted nuclear tests in 2006 and later in 2009. The last such test was performed in January 2013. You can see the complete North Korean nuclear test list here. Seeing this time lapse map makes me think about us, humans. For example, the Japan area looks more like a land where there is perpetual war. The action begins slowly, in July 1945, with the nuclear test near Los Alamos. A month later appears the Hiroshima and Nagasaki explosions. Then, months become seconds and explosions start filling the world map in a strange choreography that’s almost terrifying if you think about its real meaning. The original 14 minute video can be found here.